You are here: Home » GENRE » Fantasy » The Shannara Chronicles 2nd season (trailer). The Shannara Chronicles 2nd season (trailer). 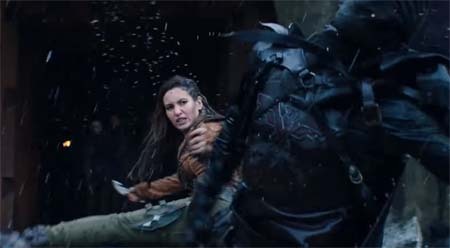 Here comes the trailer for the The Shannara Chronicles 2nd season on TV. I caught the first season and it was okay, but I got the feeling my kids enjoyed this one more than me. Must be getting old. One year after the events of the last season of The Shannara Chronicles; The Four Lands are in chaos – the re-emergence of magic has the populace terrified, and an organization called The Crimson is hunting down magic users. Season 2 of The Shannara Chronicles premieres October 11th 10/9c (2017) on Spike TV. « A Wolf To Guard The Door by Tyree Campbell (ebook review).